There are four videos throughout this post – scroll through to watch the full story. 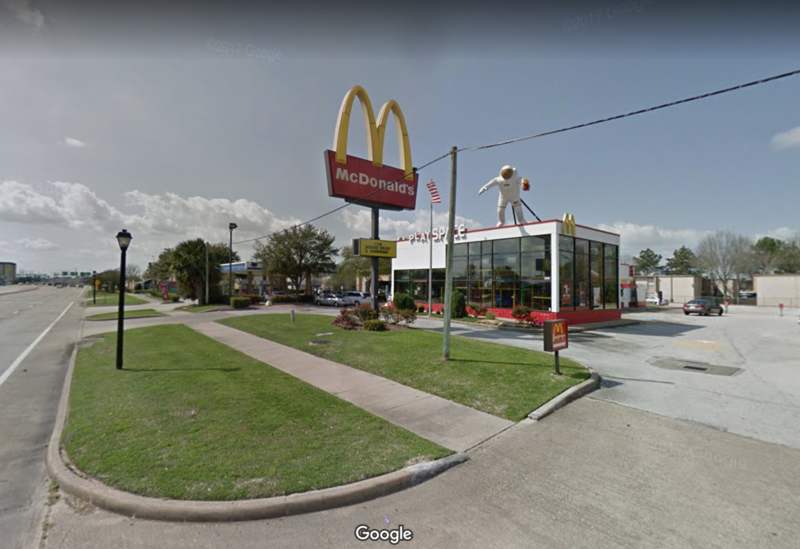 If you ever find yourself driving through the Clear Lake City community of Houston, keep your eyes open for an interesting McDonalds. Looming in the sky on East NASA Parkway next to the golden arches is a giant astronaut, advertising the “Play Space” area of the space-themed establishment. It’s commonplace in the neighborhood, which is infused with the culture of a local celebrity, the NASA Johnson Space Center. NASA’s Manned Spacecraft Center is down the street from another couple of locations which you may be familiar with: the re:3D Houston HQ, and the subject of today’s story: the Clear Lake City-County Freeman Branch Library. It’s only fitting given the local climate that this library would be an innovator in its space. Walk upstairs and you’ll find an unexpected surprise nestled among the bookshelves on the second floor: a makerspace. The library has found itself among the first of its kind leading the charge to reinvent the literary institutions as a hub for community creators to access cutting-edge technology. 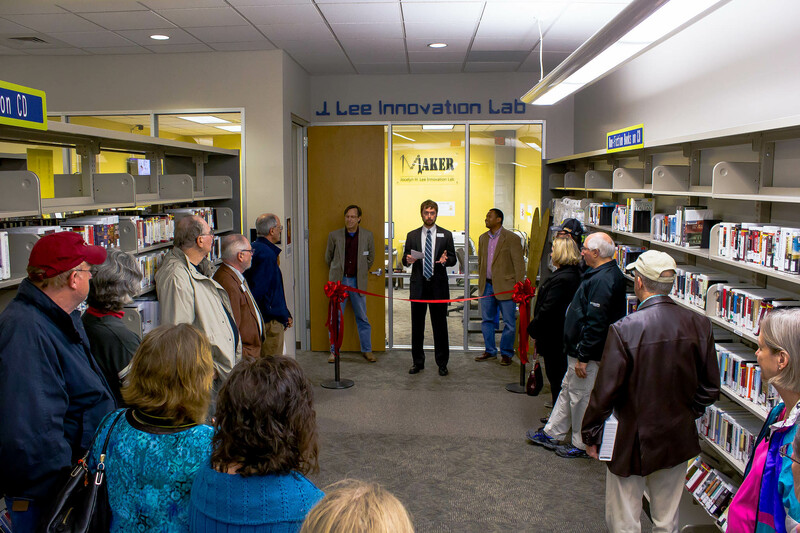 Named the Jocelyn H. Lee Innovation Lab, the space was made possible thanks to an extremely generous individual donation. Jim Johnson was the Branch Manager of the library during the shooting of this story last year, and and now works at Harris County Public Library’s administrative offices. “It started all the way back when we received a notice about a bequest received from Mr. Jocelyn H. Lee in 2013, and actually found out exactly how much he was giving us in 2014,” he explains. The sizable sum allowed them to put plans in place to purchase equipment and cordon off an area for the lab. 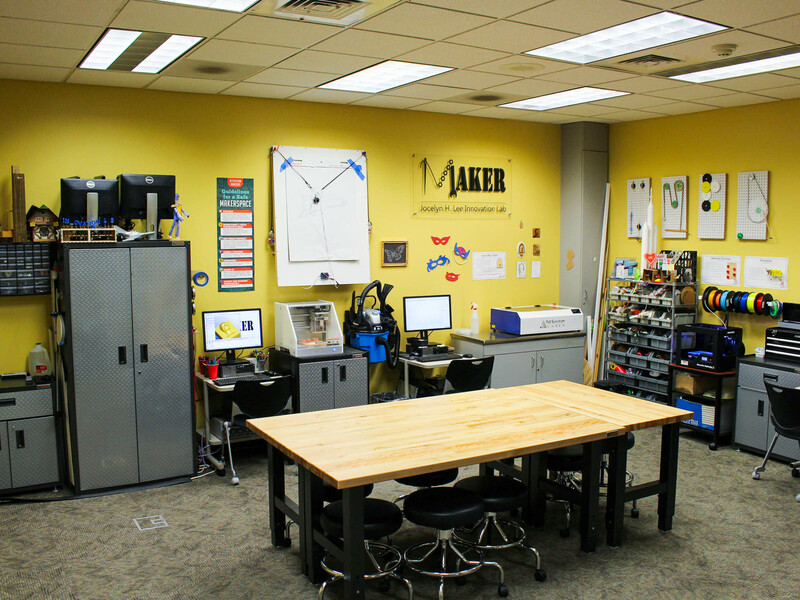 They officially opened the doors to the makerspace in February 2015. 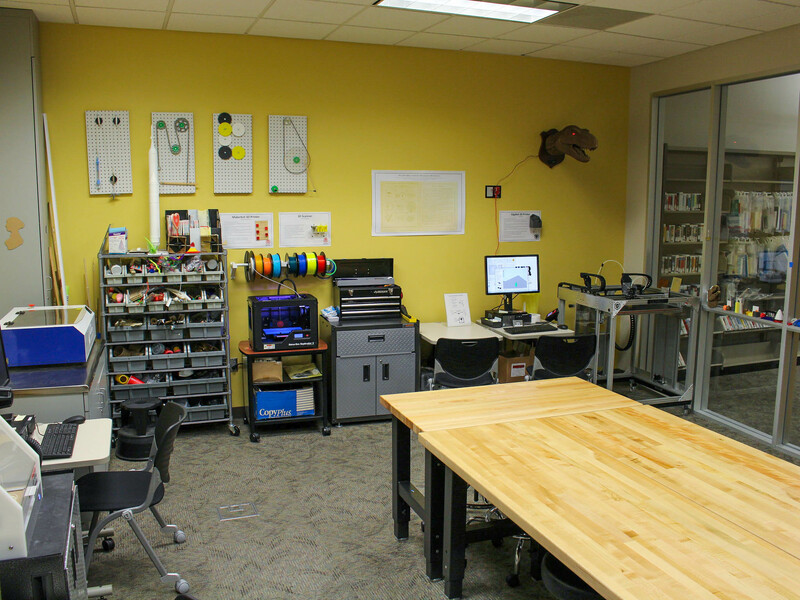 The lab boasts a variety of equipment, from a CNC to laser cutter, soldering stations to dremel tools, Arduinos and Raspberry Pis, and of course, 3D printers – the largest being a Gigabot. “3D printing tends to be a cornerstone feature of the lab,” says Jim. All the equipment and classes offered by the lab are free of charge to the community. Some of the groups taking advantage of the lab are local robotics teams and home-schooled groups of students. One such group is FTC 8668: Error 404, Team Name Not Found, a local FIRST Tech Challenge robotics team comprised of high school home-schooled boys. The boys didn’t bite, protesting that the printed version wouldn’t be strong enough, so Clarissa took matters into her own hands. She visited the lab on her own, using Gigabot to print out a small, proof-of-concept of their robot’s chassis to show the team. They were sold. It’s also proven to be quite the teaching tool. “For me the point was educational,” explains Clarissa. 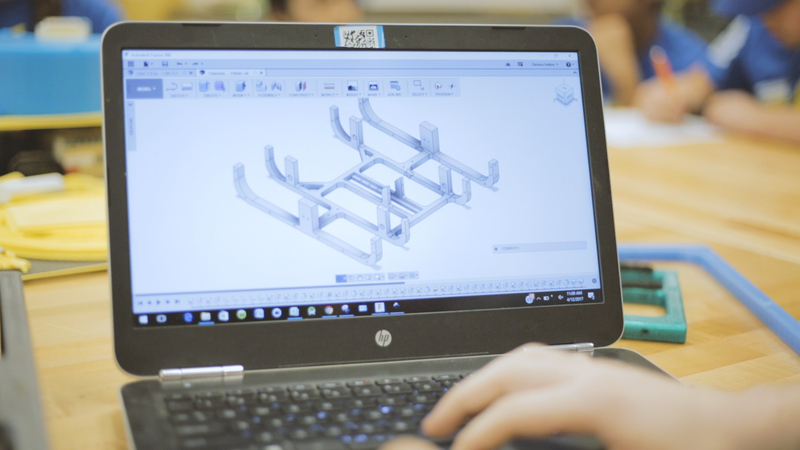 “Because that’s the way that it is in the real world: you truly design something before you manufacture it.” Forced to flesh out a part on the computer through CAD before printing, the team learned the lessons of design cycles, prototyping, and manufacturing. 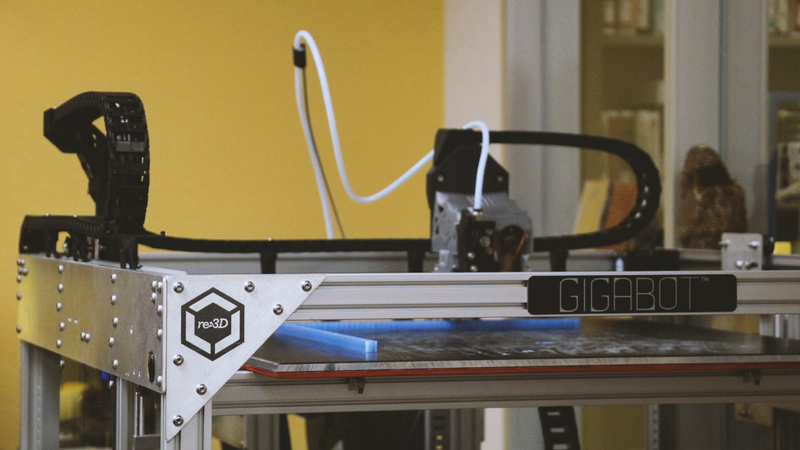 Having access to a large-scale 3D printer has been crucial to the team’s robot design. In addition to strength, the 3D printed chassis affords them more mounting opportunities for their robotics challenges, a more compact electronics section, and a far cheaper alternative to the aluminum they’re typically forced to buy for competitions. Clarissa explained that where one small piece of aluminum channel may run them $15 – “You don’t know how much you put into this” – they can get several iterations of their entire chassis out of a $30-40 roll of PETG. That’s something that the library is trying to change. Another group making themselves comfortable in the lab is the FLL Thunderbolts #17355 robotics team. And stand out they have. “This is only our second year as a robotics team and we’re going to World,” says teammate Israel. The FIRST World Championship is the culmination of the FIRST LEGO League, FIRST Tech Challenge, and FIRST Robotics Competition. “It’s the best of the best,” explains Nick from Error 404. The Thunderbolts’ challenge was to design a product for animal-human or animal-animal relationships. They chose the problem of multi-dog families where a dominant dog eats the others’ food. 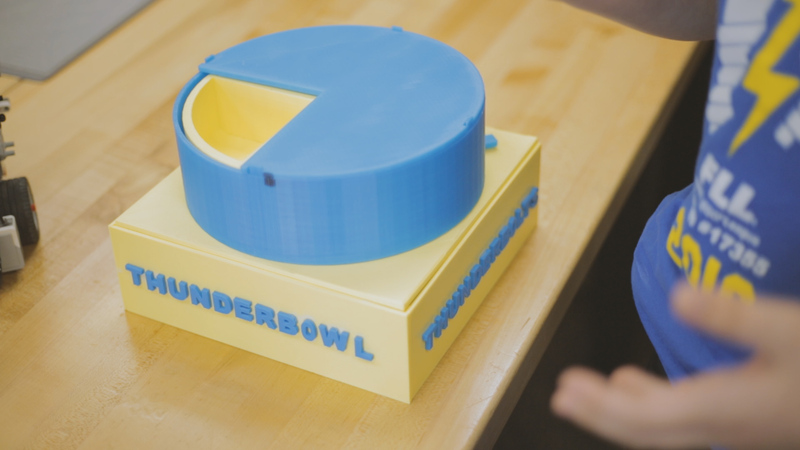 Underwhelmed by the solutions available on the market, the team designed The Thunderbowl, a food bowl that opens and closes based on a bluetooth tag attached to a dog’s collar. Multiple types of food can even be enclosed in the same bowl, revealed in different compartments depending on the tag sensed. The team started their prototyping process with paper plates, then moved to LEGOs, and finally graduated to 3D printing. In addition to helping them stand out among the competition, the 3D printed model is welcomed by many of the teammates for its durability. A fitting attitude for the NASA-neighborhood library. Learn more about the Jocelyn H. Lee lab here. See more photos courtesy of the Harris County Public Library here. Learn more about the Error 404 Robotics Team here. Learn more about the Thunderbolts Robotics Team here.